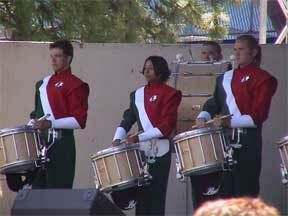 The Santa Clara Vanguard snare line performs at the Sacramento Jazz Jubilee. The Santa Clara Vanguard performed on Memorial Day at the Sacramento Jazz Jubilee. The corps performed its 2003 show, and then combined with the River City Regiment (a senior corps from Sacramento) to play "God Bless America." More than 120,000 people attended the festival, and approximately 500 heard the Vanguard concert. The evening before, the Vanguard performed a dress rehearsal at Highlands High School in Sacramento, the site of their Memorial Day camp. A crowd of about 150 parents, boosters, alumni and fans turned out to cheer them on.